Theme: How can the EPA better engage the African-American community around environmental issues? * better understand how EPA news specifically impacts particular constituents. How does EPA work affect moms, kids and families? * better translate what the EPA does and explore how that can be turned into jobs. * provide EPA information regularly, particularly regarding the status of rulemaking. * prepare groups with talking points to better inform our public. * better package the information in order to be delivered with more impact. * continue to have people that look like us sitting at tables discussing. * utilize black media to help carry our message. * Examine a framework to do better at connecting local activists/organizations with their respective communities. * make things more relevant to communities and the people that live in them. * develop some kind of EPA Boot Camp and do something similar with the younger generation especially. * find more creative ways to connect to people and send out information, using multiple channels (social media, churches). * put a little pressure on the non-profits and their CEOs to start connecting with each other and reaching out into their communities more. Environmentalists exasperate me sometimes. Some wealthy liberal donor environmentalists do this when they write, speak or act stupid. Some wealthy liberal donor environmentalists are stupidly comparing President Obama's decision on the Keystone XL Pipeline to Abraham Lincoln's push to end slavery. SIGNED INTO LAW in 1964 by President Lyndon B. Johnson, the Wilderness Act was a triumph for all who enjoy the open landscapes of America and the natural heritage they represent. Today, more than 100 million acres are protected by the National Wilderness Preservation System to ensure these areas remain ecologically sound and environmentally pristine and for future generations. In 2014, the Wilderness Act will reach its Golden Anniversary. In tribute to this milestone, Wilderness50—a coalition of government agencies, nonprofit groups, foundations, and other supporters—have joined together to celebrate the 50-year mark through numerous educational events, including the "Wilderness Forever" nationwide photography competition and print exhibition at the Smithsonian. The Wilderness50 coalition, distinguished panel of judges, the Smithsonian Institution, and the team at Nature’s Best Photography now invite photographers at all levels of experience to enter the new "Wilderness Forever" photography competition. This nationwide call for entries seeks your best photos and personal stories and experiences within America’s protected wilderness areas (go to the official list link at top, right). Questions? Call 703-467-9783 or Email: wilderness@naturesbestphotography.com. Russia is to help Ghana develop its nuclear industry the Ministry of Energy and Petroleum has announced. It said in a statement issued in Accra on Saturday that the Ministry was scheduled to go into an agreement with the State Atomic Energy Corporation of Russia - ROSATOM - on the specifics of joint projects facilitating the implementation of plans by Ghana to develop a nuclear industry. This would take place in June when a team of Ghanaian officials participate in the International Ministerial Conference on Nuclear Power for 21st Century to be held in St. Petersburg, Russian Federation. The Director General of the Ghana Atomic Energy Commission, Professor Benjamin J. Botwe Nyarko, said the move was a follow-up to a Memorandum of Understanding (MOU) signed between the Ministry of Energy and ROSATOM last year in which the parties agreed to establish bilateral cooperation in the field of nuclear energy for peaceful purposes. The ROSATOM team included Yury A. Sokolov, Vice President, Director-Department of Global Nuclear Infrastructure and Dmitry Bazhenov, Chief Expert, Marketing and Business Development Department. It was accompanied by Igor Degtyarev, Minister-Counsellor of the Embassy of the Russian Federation in Accra. AAEA is implementing a program callled Civil Rights Wilderness Act 50/50 (CRWA5050) to recognize these two very important laws. CRWA5050 will include increasing African American participation in wilderness areas. Such participation will include field trips, creek bank stabiliztion, campground monitoring, wildfire mitigation and wildlife observation. AAEA already operates a program in California called Compton-To-Catalina, which is supported by Southern California Edison. We also attempted to build a wood-chip to electricity plant in Mississippi, which was designed to utilize a renewable resource and increase employment in one of the most depressed areas in the United States. Such programs seek to both mitigate wildfires and create employment. The CRWA5050 Program will expand upon these concepts. AAEA intends to participate in the planning and celebration of the two landmark laws. The National Park Service, U.S. Forest Service, U.S. Fish and Wildlife Service, and Bureau of Land Management, and the Society for Wilderness Stewardship are planning a celebration of the 50th anniversary of the Wilderness Act. These four federal agencies are responsible for managing the National Wilderness Preservation System and are joining with other national wilderness organizations to spotlight and celebrate the nation’s wilderness. The 50th Anniversary National Wilderness Conference is on Oct. 15-17 in Albuquerque, N.M. Follow the 50th anniversary of the Wilderness Act on Facebook and visit the official website. July 2, 2014 is the 50th anniversay of the signing of the Civil Rights Act and Sept. 3, 2014 is the 50th anniversary of the signing of the Wilderness Act. The Civil Rights Act of 1964 (Pub.L. 88–352, 78 Stat. 241, enacted July 2, 1964) is a landmark piece of civil rights legislation in the United States that outlawed major forms of discrimination against racial, ethnic, national and religious minorities, and also women. It ended unequal application of voter registration requirements and racial segregation in schools, at the workplace and by facilities that served the general public (known as "public accommodations"). Powers given to enforce the act were initially weak, but were supplemented during later years. Congress asserted its authority to legislate under several different parts of the United States Constitution, principally its power to regulate interstate commerce under Article One (section 8), its duty to guarantee all citizens equal protection of the laws under the Fourteenth Amendment and its duty to protect voting rights under the Fifteenth Amendment. 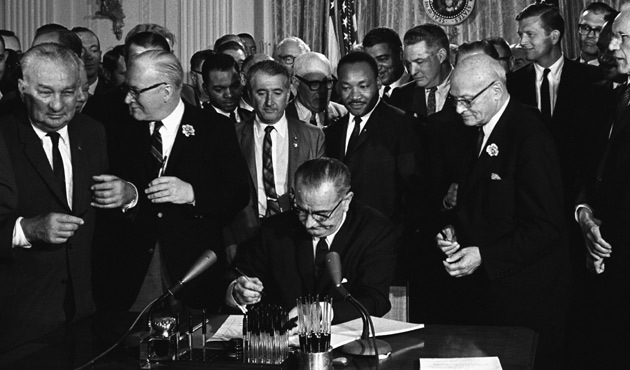 The Act was signed into law by President Lyndon B. Johnson, who would later sign the landmark Voting Rights Act into law. The bill was called for by President John F. Kennedy in his civil rights speech of June 11, 1963, in which he asked for legislation "giving all Americans the right to be served in facilities which are open to the public—hotels, restaurants, theaters, retail stores, and similar establishments." The Wilderness Act of 1964 (Pub.L. 88–577) created the legal definition of wilderness in the United States, and protected 9.1 million acres of federal land. 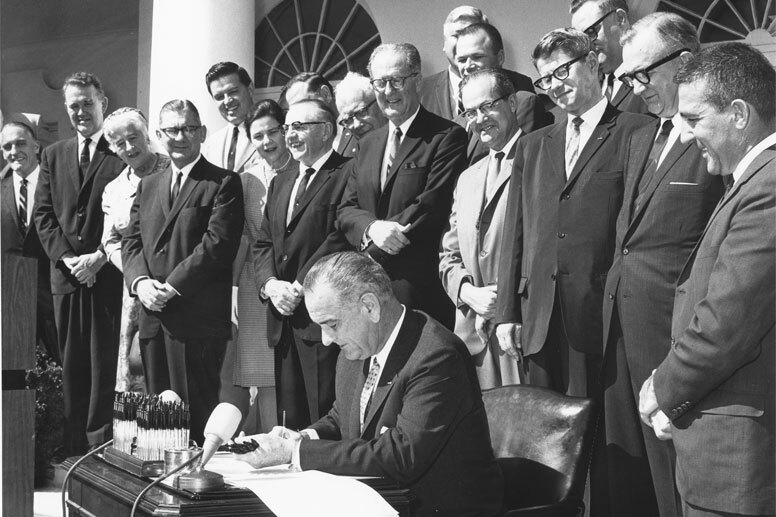 The Wilderness Act was signed into law by President Lyndon B. Johnson on September 3, 1964. President Barack Obama has nominated Mel Watt, a longtime Democratic congressman from North Carolina, to lead the Federal Housing Finance Agency (FHFA), which oversees government-controlled mortgage giants Fannie Mae and Freddie Mac. FHFA regulates Fannie Mae and Freddie Mac, the bailed-out mortgage financiers that together own or guarantee about half of all outstanding U.S. home loans. Watt was first elected to the House of Representatives in 1992, where he has served on the chamber’s financial services committee. On the banking panel, he perhaps is best known for trying to stamp out predatory lending. He’s also championed access to home loans for low-income borrowers and those with spotty credit. He has served North Carolina's 12th congressional district since 1993. An attorney from Charlotte, North Carolina, Watt previously served one term as a state Senator and served as campaign manager for former Charlotte Mayor Harvey Gantt. Watt is a graduate of York Road High School in Charlotte. He was a Phi Beta Kappa graduate of the University of North Carolina at Chapel Hill in 1967 with a BS degree in Business Administration. In 1970, he received a JD degree from Yale Law School and was a published member of the Yale Law Journal. 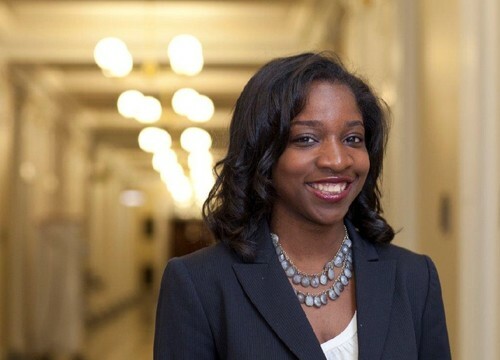 Watt practiced law from 1970 to 1992, specializing in minority business and economic development law. He has been a partner in several small businesses.